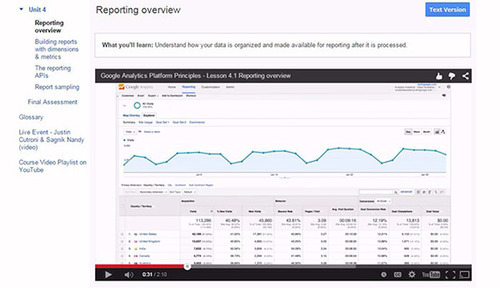 One of the best ways to upskill in Google Analytics or improve on what you already know is through the Google Analytics Academy. One huge piece of important advice, have your analytics account open on another tab as you study and click in and out, checking that you understand what you are being taught. If you do not have a Google Analytics account, get access to one before you start, as a friend or your employer. The study programme is broken down into modules, doing it in the below order helps you understand the overall analytics, then digital specific, into mobile to understand one of the most important forms of analytics in online engagement today, then how to make choices based on the data you collate. You can study online for free, at your own pace. Each course is broken up into modules with videos on the topics in each section and a short q and a at the end of each. DO take the Q & A, you’d be surprised how much information you actually may have missed by doing so, it also helps embed the information you have just been watching. By taking the Google Analytics IQ Exam, you can add that you have this Google certification to your CV, LinkedIn and general knowledge bank. 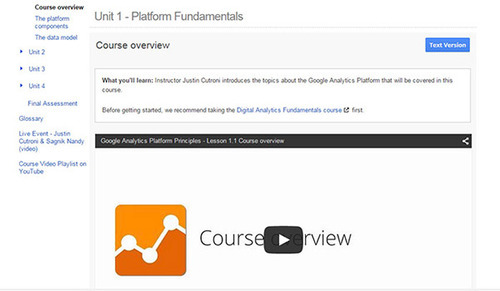 The Analytics IQ Exam covers Google Analytics Platform Principles & Digital Analytics Fundamentals. Register as a Google Partner, then once you have taken your exam and received your certification, your profile will update this. You also then go onto a Google Partner data base where companies may approach you to work with/ advise them. Pay a $50 fee and take your exam! Google recommends that allowing for studying and completing exercise, up to 3 hours per course, that’s 6 hours study for your Analytics IQ Certification and a further 6 for upskill! But, they do point out that your level of familiarity with the material will of course affect this. You can also upskills in AdWords in the same way. Just remember certifications are valid for 18 months so make sure to set a reminder to upskill when they expire.